After more than five years, over the course of which the EU agenda was primarily determined by the economic crisis (with financial markets calming down but political and economic challenges yet to be resolved), popular support for the EU project tends to be in decline. A growing number of polls suggest that we are likely to observe a surge of protest votes and voting absenteeism, both of which represent big challenges for the European Union. As a consequence, in this clear democratic paradox, an institution constantly increasing its powers and influencing the lives of EU citizens to an ever greater extent, needs to find a way to communicate to them its prominence, and persuade them to take part in the election. The European Parliament elections of 2014 may play an important role in the evolution of British policy towards the European Union. Admittedly, the results of these elections are unlikely to be viewed in the United Kingdom (or in many other member states of the Union) as matters of great political importance in themselves. The Conservative party’s policy towards the European Union is at the very least an important piece of the jigsaw that makes up political and popular attitudes towards the European Union in Britain. If the Conservative Party enjoys an absolute majority after the next general election in 2015, it will be in a position to convert its own European policy into British governmental policy. Nor can it be excluded that, over the coming months, the Labour Party will wish to, or think itself obliged to, mimic in its own European policy some elements of Conservative European policy if this policy is seen to be attractive to British voters. The German EU Debate Ahead of the European Elections: Plus Ça Change? Is the German public eventually to wake up to “debating Europe”? What impact will the European campaign have on the new coalition government? How can the Social Democrats match their ambition of changing the majorities in the EU with their performance as part of a coalition at home? And how do the other German parties place themselves in the run for the 96 German seats in the European Parliament? This paper will show that, actual turnout and results of the European elections aside, the drive of the Lisbon Treaty has started to Europeanise political parties in the German national context. 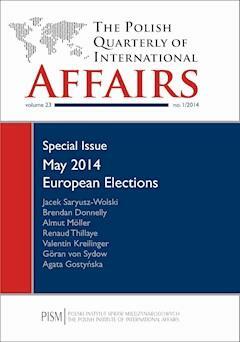 Will the European Parliamentary Elections Give France a New Momentum for “Social Europe”? Clearly, pro-EU mainstream French political parties are braced for a drubbing. European elections have always been conducive to antiestablishment protests, given the complexity of the issues dealt with by the European Parliament and their so-called secondary importance. Yet given the high level of unemployment and France’s anaemic economic prospects, this time might be different. The government is faced with the Sisyphus task of again persuading voters that a change for the better is still within reach at EU level. Paradoxically, this might not necessitate a left-wing European Parliament. As this article argues, the notion of “Social Europe” is still relevant to describe the objectives that Paris seeks to achieve by the means of EU integration, but mainly in the context of the eurozone crisis. The European Parliament is a natural but weak ally of the French government on socio-economic coordination, hence the significance of the upcoming European elections needs to be qualified. Restoring confidence with Germany and France’s partners in the country’s ability to regain competitiveness and sustain its welfare system is in fact the real EU priority for the French president. The parliaments in the EU are facing a choice. They may exploit the existing possibilities, continue business as usual (possibly with declining participation in inter-parliamentary cooperation, so no change), or bypass existing interparliamentary structures. The last and most extreme scenario would mean that some national parliaments, for example the six founding members or the Member States that have adopted the euro, create their own conference, with serious repercussions to “pre-in” countries, to the EU institutions, and to the inclusiveness of economic and financial governance. The second option (business as usual) does not help building a genuine Economic and Monetary Union either. Only the first scenario would help reduce the existing weakness in democratic accountability and legitimacy, both in general, and especially in connection with the genuine EMU in the making. An inter-parliamentary conference as a place to discuss these policies could have the positive effect of gradually becoming an arena in which the future direction of the Union’s economic policy is shaped. This paper will argue that the emergence of party-based Euroscepticism is an outcome of the changing role of parties and party competition. Drawing on theories of party democracy, I will show that the pressure on mainstream parties to live up to national European commitments and be responsible in EU affairs is challenging their ability to be responsive to voters’ needs. Their efforts to stress classic left-right splits are falling flat in a political arena that relies on a degree of consensus between governments of all political hues, and which produces outcomes that do not fit neatly into either right or left schemes. The result of this lack of party competition over policy is a growing instance of opposition to polity. Whilst mainstream parties compete to retain their place in the polity, “populist” parties, unmotivated by concerns of office, fight exclusively over policy. Mainstream parties have responded to the resulting politicisation of EU affairs by seeking to externalise conflict, not least by resorting to referendums and delegating conflict resolution to non-political bodies and arenas. The move has backfired. The European Parliament and European Commission after the May Elections: An Indispensable Partnership? This article will clarify the debate on this personalisation of the elections. By placing the relationship between the European Parliament and Commission in a longer-term context, this article debunks the notion that personalisation marks a revolution in inter-institutional relations leading to the sudden politicisation of the Commission. Rather, it is just one in a long line of moves by the EP towards reinforcing its scrutiny of the Commission’s actions. Moreover, this article argues that it is the undermining of the community method in the EU since the crisis broke out, coupled with the apparent shift of power and discretion towards national governments, that is pushing the European Commission into the arms of the EP. This is particularly clear in the EU economic and financial agenda, where the European Council has grown to take the predominant role in agenda-setting, traditionally the Commission’s domain. Finally, this article presents some prospects for cooperation between the Commission and the Parliament.